Some Harmony products allow you to upgrade your home entertainment experience with additional remotes, keyboards and/or mobile apps. View your Harmony product in the left column to see what upgrade options are available. 1 Requires a Harmony Hub upgrade before this add-on may be added. 2 Harmony Companion comes with a remote similar to the Smart Control Add-on, but has additional buttons optimized for home control. * Product availability may differ for your region. View available products. All upgrade combinations require a Harmony Hub. The hub is the center of Harmony home entertainment control and works to keep your devices and other Harmony components in sync. There should only be one hub in your Harmony setup. Launch the Harmony mobile app and connect to your existing Harmony Hub. Select Menu > Harmony Upgrade > Add Remote or Add Smart Keyboard. Select Add Now and follow the on-screen instructions to finish adding your device. Sign into your MyHarmony account using the MyHarmony desktop software. Select your current remote from the Remote Gallery. Select the Upgrade button in the left tab and select the device you wish to add. Follow the on-screen instructions to finish adding your device. No, two hubs cannot be paired with each other. 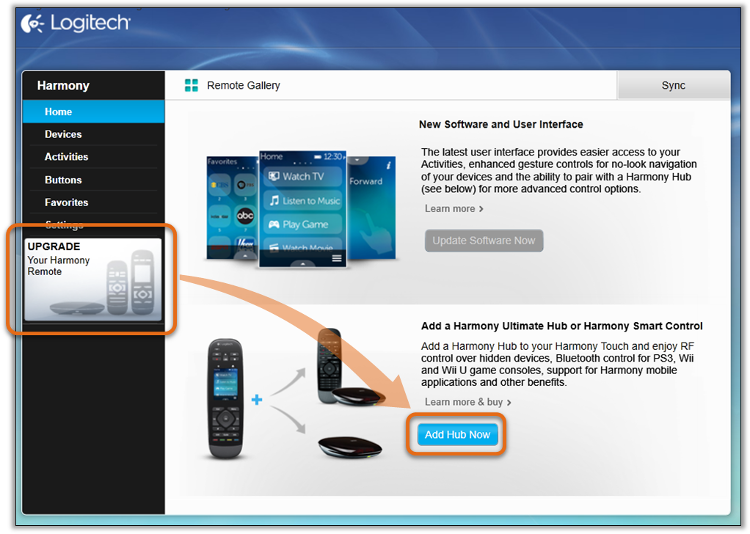 Yes, adding a hub to an existing remote-only setup requires the MyHarmony desktop software. Attempting to add another touchscreen remote will replace the original remote. A touchscreen remote must be paired with a non touchscreen remote and vice versa. It is not possible to downgrade or separate your remotes once they have been bundled together.